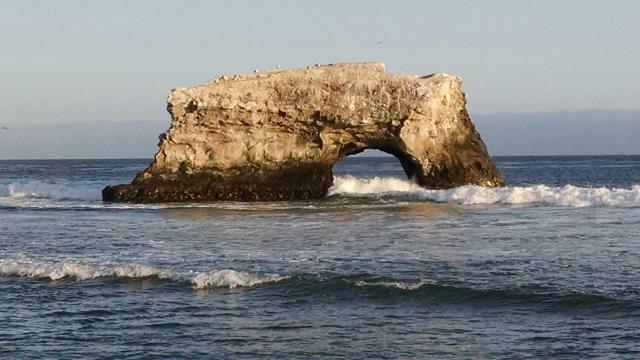 A closer view of the remaining arch near shore at Natural Bridges State Beach. Rising just south of San Francisco, through San Mateo, Santa Cruz, and western Santa Clara counties, the Santa Cruz Mountains offer amazing scenery and outdoor recreation opportunities for Bay Area residents and visitors. This compact, detailed reference guides hikers, bikers, bird watchers, naturalists, and other outdoor enthusiasts through redwood canyons, conifer and oak woodlands, along the rugged Pacific coast, and to breathtaking summit views of the Bay Area and beyond. Each chapter includes an overview of the park or preserve with directions on how to reach it; detailed trail maps; and descriptions of trail conditions, ecology, topography, geology, history, and points of interest. At the beginning of the book, a map illustrates all the public lands in the mountains, and a separate chapter lists each unit of public land alphabetically. Special sections highlight noteworthy features, including poison oak, acorn woodpeckers, logging history, interesting characters, banana slugs, the best places for dog walking, and more.